This past weekend was a three day weekend due to the federal holiday we had. This gave the plebes and the rest of the regiment an opportunity to get out of Kings Point for a few days. I traveled with a good friend to his house in Sterling, Virgina. Which is about 20 minutes from Washington D.C. I had quite a bit of fun on my visit. His family was excellent and made me feel at home. I met a lot of new people and spent the days relaxing. 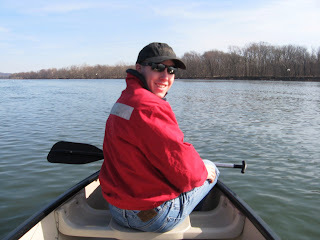 We went canoeing down the Potomoc River which was a lot of fun. Although I didn't go into D.C. to do the tourist stuff I still got to see a lot. It was a great break and i can't wait until the next one, spring break!